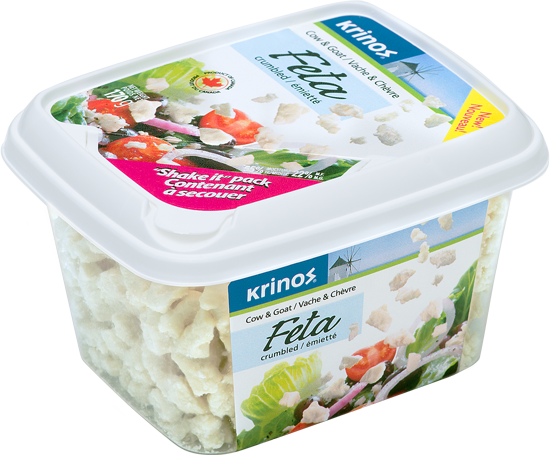 Adding flavour to any meal is made easy with Krinos Crumbled Feta Cheese. Ready to use right out of our “Shake-it” pack, crumbled feta is great on salads, omelettes, pizzas and pastas. Mix it with olives, tomatoes and cucumbers for an instant Greek salad. Low in cholesterol. Gluten Free. Sulphite Free. Pasteurized milk and/or milk ingredients (cow), pasteurized goat milk, bacterial culture, microbial enzyme, calcium chloride, salt, cellulose, natamycin.